Earlier this year we wrote about the unlikely story of three graphic designers who discovered a copy of the book that dictates every aspect of the subway system, forgotten in the basement of the design studio Pentagram. 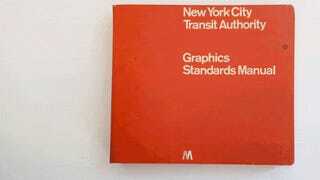 Now, the MTA has agreed to reprint the 44-year-old design bible for sale—but only for the next 30 days. We take it for granted that the subway system looks the way it does today. In fact, it was long a morass of utterly confusing chaos. "New York City is a chaotic place, and in the 1960s, no place was more chaotic than the New York City subway system," says Pentagram partner Michael Bierut, who was a mentee of one of the manual's designers, the late Massimo Vignelli. "If you went down to the subways in the mid-60s, what you'd encounter is this profusion of signs that were completely inconsistent." And so, in 1967, the MTA hired two young, still relatively unknown designers named Massimo Vignelli and Bob Noorda to get its act together. For four years, they worked to create a comprehensive, flexible, and utterly eloquent book that designers of future generations could use, long after the subway itself had changed. What Noorda and Vignelli came up with was the Graphic Standards Manual, a book that lays out exactly how the MTA should look: Typography, colors, architectural detailing of signs, even the information design of the maps. It's 364 pages of simple, concise planning. And it's just as usable today as it was in the late 1960s, when it was created. Of course, the physical copies of the manual are few and far between—the discovery of an original copy, last year, spawned a website, a Twitter account, and massive amounts of public interest. And so, this August, the MTA finally agreed to let the designers who rediscovered it create a Kickstarter to reprint the five-ring bible as a hardcover book. The MTA just had one caveat.